These words often get watered down and overused describing sporting events, but in the case of the 1967 NFL Championship – known as the Ice Bowl – those adjectives land appropriately upon a frozen Lambeau Field on December 31, 1967. The Packers won the game 21-17 on a Bart Starr quarterback sneak for a touchdown with seconds left in the game. The game was a championship rematch between the Green Bay Packers and Dallas Cowboys, who battled in the 1966 NFL Championship at Dallas. Like the Ice Bowl, it also came down to the final seconds, and also wound up in the Packers’ hands. The 1966 affair might have actually been a more exciting game overall. The Ice Bowl, however, is likely the single most famous game in NFL history, especially among longtime fans. 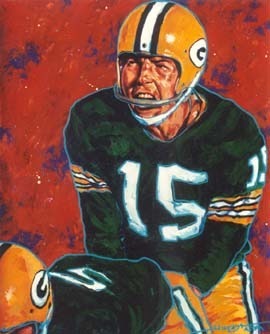 Besides being decided in the waning moments with Bart Starr’s quarterback sneak to score the winning touchdown (read his story of calling the play below), the weather and field conditions provided an environment that multiplied the drama and made it not only a contest to score the most points – but to survive. The temperature at game time was somewhere around -15, with a windchill nearing -50. The heating system beneath the field broke, and the field froze. Refs couldn’t use whistles because the first time head ref Norm Shacter blew his, the whistle froze to his lips and tore his skin when he removed it. Officials vocally called the end of plays. I was fortunate to speak with several players who played in the Ice Bowl while writing The Game before the Money: Voices of the Men Who Built the NFL. Below are some of their stories recalling the Packers’ 21-17 victory, earning them a spot in Super Bowl 2. You can read all of these players’ stories regarding their lives and careers in The Game before the Money. Like in 1966, the Packers jumped out to an early 14-0 lead, behind two Boyd Dowler touchdown receptions. The score remained 14-10 until early in the fourth quarter, when the Cowboys running back Dan Reeves used the skills he learned as a quarterback in high school and college. Green Bay got the ball back with under 5 minutes left, and began the winning drive. Bart Starr, Packers: “You plan for what you’ll want to do in certain down and distance situations and at certain time elements in the game. We came down to the last few minutes, but the field had become very unstable. That was a big factor in our play calling on that final, game-winning drive….we tried a couple of end runs, and that’s a good example of what we could not do. Green Bay drove to near the goal line, at the south end of the field. The turf was extremely slick. You might notice in the game highlights that Bob Lilly is kicking at the turf between plays. He was trying to dig a hole to establish some sort of footing. With less than 20 seconds left, Starr called time out to discuss the situation with Lombardi. Starr kept the ball, dove over the goal line, and the Packers took a 21-17 lead with a handful of seconds left. Order The Game before the Money on Amazon. Order The Game before the Money at Barnes and Noble.